Wader Quest: "Wirral Wader Festival and Severn Wader Festival" two great wader festivals in one weekend. 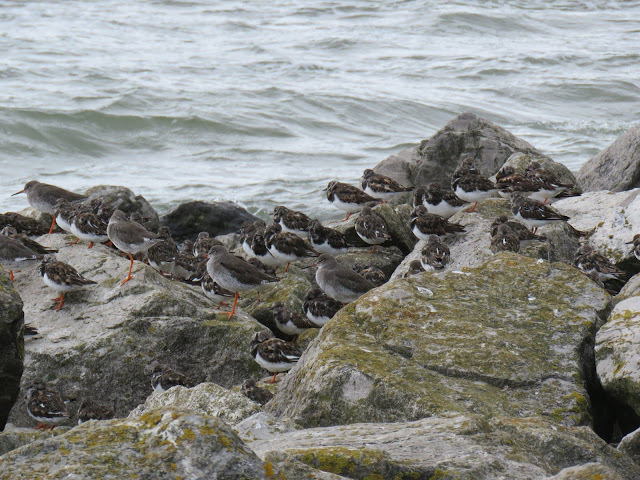 "Wirral Wader Festival and Severn Wader Festival" two great wader festivals in one weekend. 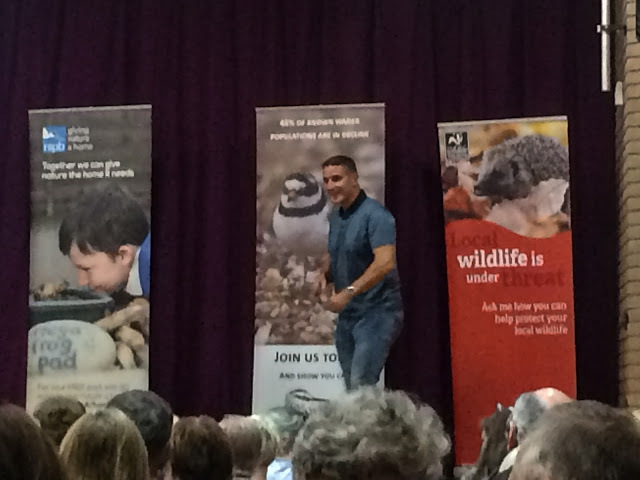 The Wirral Wader Festival started with a bang on Friday evening at Heswall Hall when Iolo Williams, BBC Wildlife presenter and environmentalist, came to give a talk entitled 'The Wildlife of the Welsh Coast". The evening was a sell-out (as you'd expect with someone of Iolo's popularity) with the last few tickets being taken on the night by lucky chancers who turned up on the off-chance despite it being advertised as a booking only event. We had the great pleasure not just to sponsor Iolo WIlliams' talk but to introduce him as well. 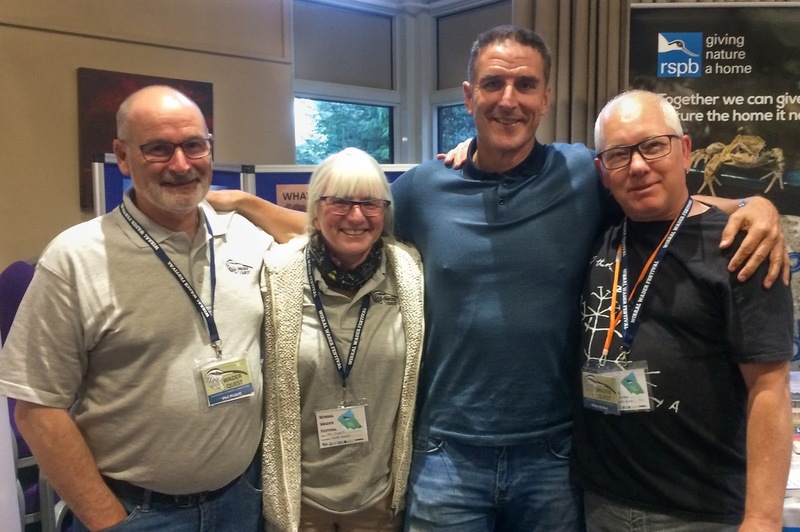 Iolo is very charismatic and thought provoking speaker who doesn't hold back on his own thoughts about many subjects that he is passionate about (good or bad) and he is not afraid of a little controversy. His talk was enlightening, engaging and entertaining, but he didn't skirt around the serious issues facing our wildlife these days. The presentation was very well received by everyone to whom we spoke after the event and we received nothing but very good feed back for the night as a whole. Wader Quest took the opportunity at this event to launch our 5th Anniversary Celebration Raffle for which we sold a good number of tickets. Not surprising really when you realise the prize (which will be drawn on the 31st of November at 11:59pm), is a fantastic original oil painting donated by renowned wildlife artist Steve Cale to raise money for Wader Quest. Steve Cale's painting is 94cm x 54cm. Tickets are just £1 each but we have to restrict the entrants to those with a UK address only I'm afraid. We will take entries via email with bank transfer or Paypal payments. 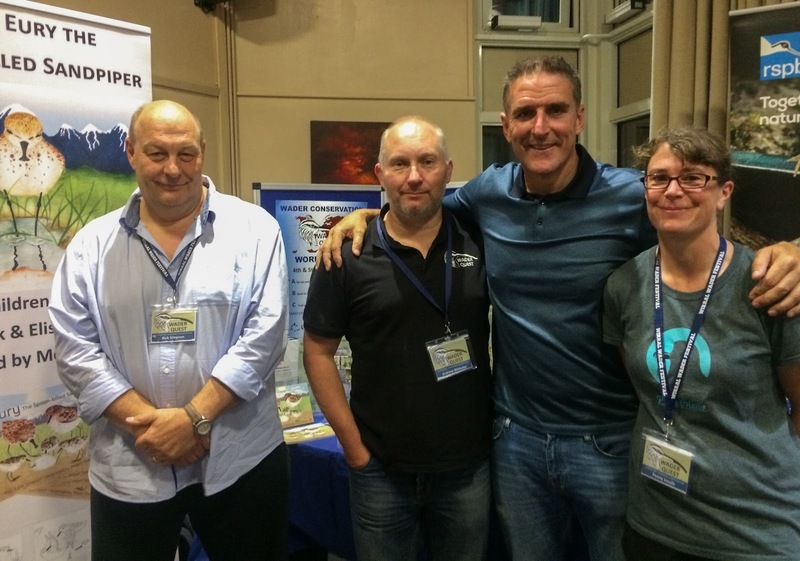 Were very lucky this year to have five wonderful volunteers enabling Wader Quest to be in two places at once. 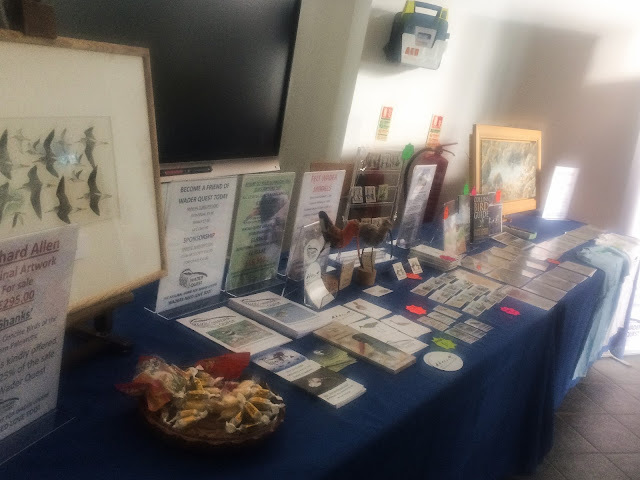 Elis and I attended the Severn Wader Festival (see below) so after the Iolo talk the weekend was left in the hands of Trustees Allan Archer and Andrew Whitelee, along with volunteer Friends of Wader Quest Penny Insole and Gail and Phil Pickett. The weather was not too unkind despite the dire forecasts, although there were sharp showers and windy conditions, and plenty of waders were seen at both the West Kirby/Red Rocks site where Allan, Gail and Phil held the fort and Hoylake where Andrew and Penny represented Wader Quest. 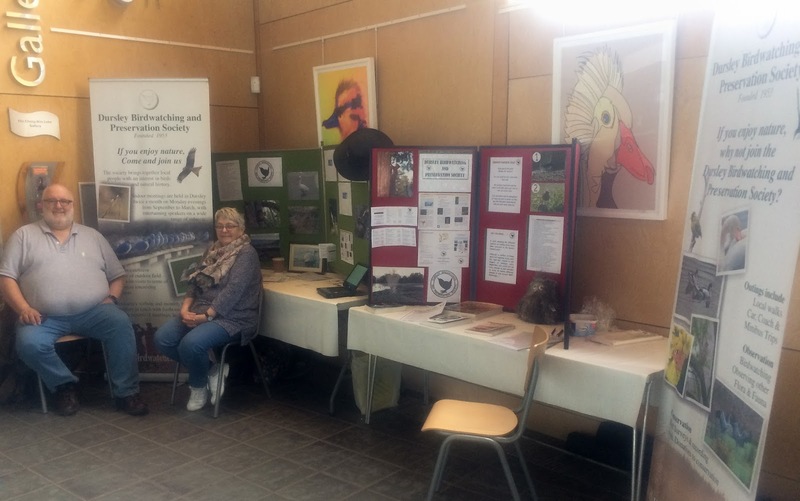 The Wirral Wader Festival has now taken place for three years and hopefully will become an annual event in the local calendar. The reason for its success is, we believe, that it is mainly directed and run by local people. We at Wader Quest do what we can to help but it is the Dee Estuary Voluntary Wardens, Cheshire Wildlife Trust, RSPB Dee Estuary - Burton Mere Wetlands staff and the Wirral Rangers that get everything organised and done on the ground. The UK was crying out for such an event, and we could not have chosen a better place for the original UK wader festival to have taken place. Indeed it is a testament to its success and popularity that other such wader festivals have now taken place in the Wash, at Walney in Cumbria and now, for the first time at the WWT Wetland Centre at Slimbridge. The Severn Wader Festival was the event that Elis and I attended this weekend at Slimbridge, the home of the Spoon-billed Sandpiper captive breeding programme, and we had the great privilege to be seated in front of the Spoony Cam display monitor giving us plenty of opportunity to use these incredible little creatures to engage with members of the public. Wader Quest came into existence because of these birds, and this programme, a fact about which we are very proud. Wader Quest stand at the Severn Wader Festival. The large screen showed the Spoony Cam all day. Again it was an incredibly enjoyable event which materialised principally through the persistence, hard work and determination of Scott Petrek the Slimbridge reserve warden, himself a self confessed wader fanatic and Friend of Wader Quest, who is doing a personal big wader year to see as many species as he can (work allowing). We also got a great deal of encouragement and support from Roberta Goodall who seems to be in every part of our lives these days being, as she is active not just as a Friend of Wader Quest, a WWT volunteer and member of Dursley Birdwatching and Preservation Society (DBPS), themselves a club sponsor of Wader Quest, and also actively involved in the Neotropical Bird Club another organisation close to our heart and which has been very supportive of Wader Quest. It was also good to meet Paul Walden, who came to the festival especially to hear the talks which we hope he enjoyed. We gave two talks, one on Saturday (An Inspiration of Waders) which was followed by an interesting talk by the BTO's Jenny Gill about the range expansion of Black-tailed Godwits and on Sunday (The Deceitful Lapwing) by a presentation about the Spoon-billed Sandpiper captive breeding programme given by one of the young people responsible for their care - Jodie Clements in front of a screen showing images of these lovely little birds being fed. 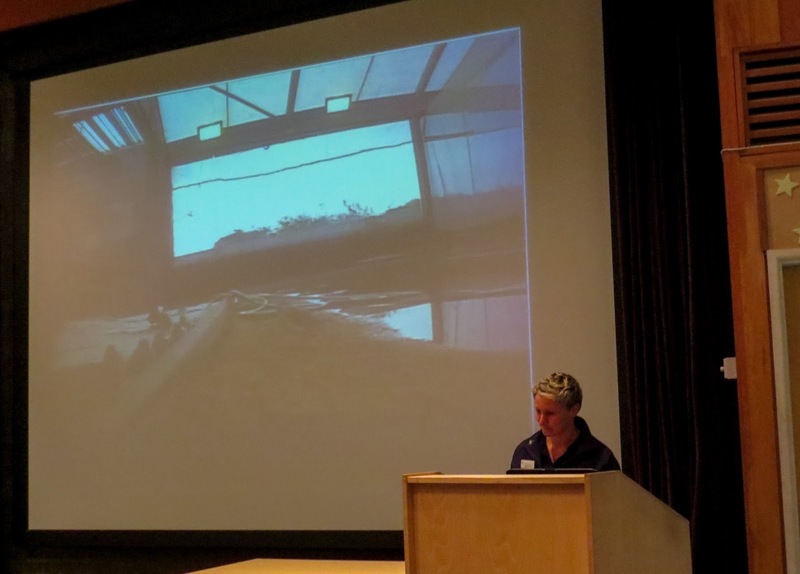 WWT staff member Jodie Clements talking about the Spoonies. We hope that this event will also become an annual event, and, if it does, we also hope that next year it'll be on a different weekend to the Wirral Wader Festival although I suspect that the tides will determine that more than anything. Having said that, whatever the logistics of these and other events, we will be sure to have a presence of some kind thanks to our dedicated and knowledgeable volunteers to whom we are very grateful for their help this weekend.